Where are you from? Your profession? We have lived in Lakeland, FL for many years. We are both retired (Ken for 6 years, Nyla for 7 years). Ken was a registered professional civil engineer and Nyla was a certified planner (AICP) who worked for the City of Lakeland for her last 13 years before retirement. When and how did you become interested in paddling? Ken took up whitewater paddling 25 years ago by taking canoe classes from the Nantahala Outdoor Center in North Carolina. That led to kayaking in Florida. 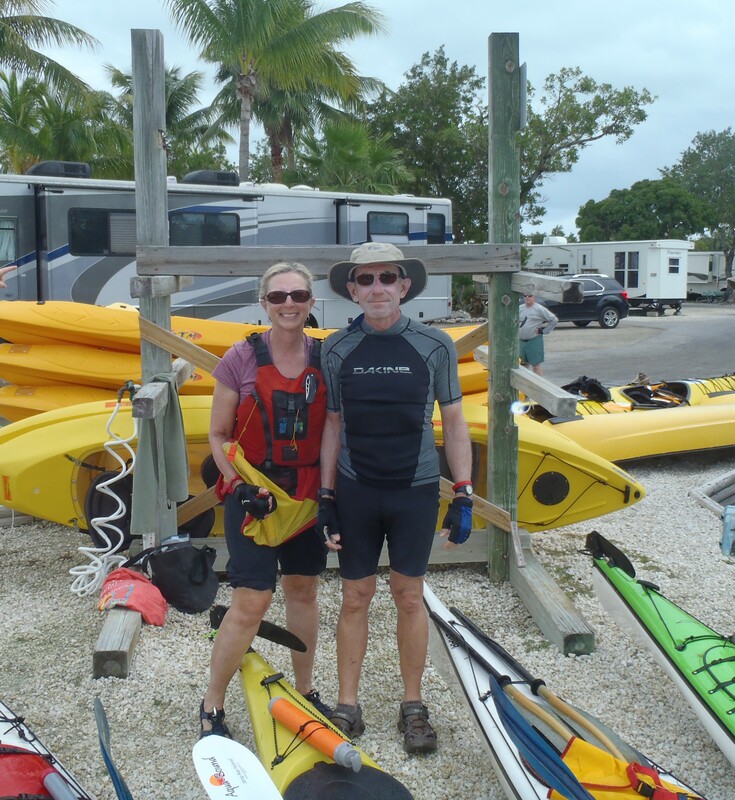 Ken introduced Nyla to kayaking 18 years ago by arranging for an introductory class at Bill Jackson’s in Pinellas Park. Where is your favorite place to paddle? We greatly enjoy paddling in the 10,000 Islands (on the west side of Everglades National Park). A number of years ago, we paddled the 100-mile Wilderness Waterway over six days from Everglades City to Flamingo at the south end of Everglades NP. What’s the most interesting thing that’s ever happened to you on a paddling trip? The most memorable time was when we were camping on Lulu Key (just outside Everglades National Park) with about 30 other people when the wonderful host of the group had a stroke. He lived on the island all winter and liked to have folks stop by. We were all sitting around the campfire and he (Mike Ward) was reading out loud from one of his favorite books. It was about 9PM when the stroke occurred. One of the fellows in our group was a Naples police officer. He called 911. That led to a helicopter over flight to see if we were real. The police then dispatched a boat from Marco Island that promptly ran aground (we found out later). So, around midnight, we carried Mike out into deep water where a large boat, from Everglades City, had anchored to take him to the hospital. That evening was memorable, but also reminded us about being prepared for emergencies. How many Paddle Florida trips have you gone on and to where? We have only been on two Paddle Florida trips (Withlacoochee River in 2014 and the Keys trip in 2015) because we have been traveling a lot (biking and hiking) and Ken has had some bad luck with injuries/illness (eight major surgeries in the last six years). What keeps you coming back? We plan to do more trips with Paddle Florida. Right now, the Keys trip in January and the Calusa in February look likely for us before we start training for cycling Montana to Alaska in the summer. We enjoy paddling, the great staff, and being around so many people with a really upbeat and “can do” attitude. Can you describe a particular Paddle Florida trip highlight? Last February we were bicycling for several days and, coincidentally, camped at Rainbow Springs the same day the Paddle Florida Withlacoochee group arrived. We were warmly welcomed by Paddle Florida staff as being part of the family and invited to share dinner and breakfast with the group. That was a great way to deal with a memorably cold, wet evening. What advice do you have for folks considering a Paddle Florida trip? Know your skill and fitness limitations. With that knowledge, in-trip adjustments can be made if necessary to facilitate safety and ensure a good time is attainable every day.